Today: Meet some of yogurt's relatives -- Greek yogurt, skyr, and labneh -- and introduce them to your kitchen, if you haven't yet already. Not so long ago, a trip to the yogurt section of the grocery store revealed the usual suspects: fruit on the bottom, a few sugary kids’ versions, nothing too exciting. It was a simpler time. But in the past few years, yogurt has exploded as a go-to breakfast, snack, and cooking ingredient. Now, many grocery stores carry tons of yogurt options, like Greek yogurt, skyr, and labneh -- the aisle seems to continue forever. 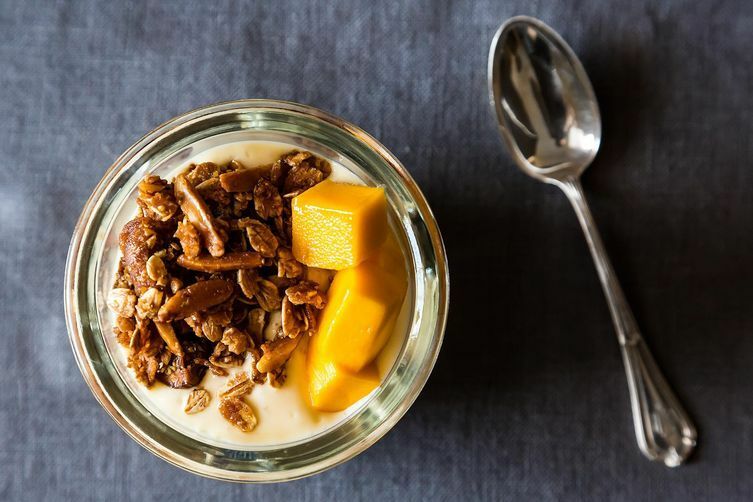 For those of you feeling overwhelmed by the possibilities, we've compiled a cheat sheet on the types of yogurt you can find -- and the best ways to use them -- so you can shop with ease and find your perfect yogurt match. 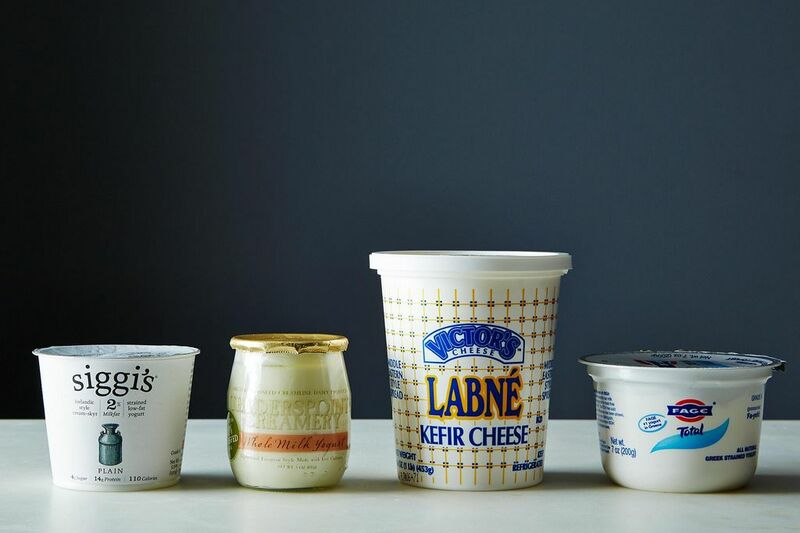 From left to right: Regular full-fat yogurt, Greek yogurt, skyr, and labneh. Let's start by going back to basics. 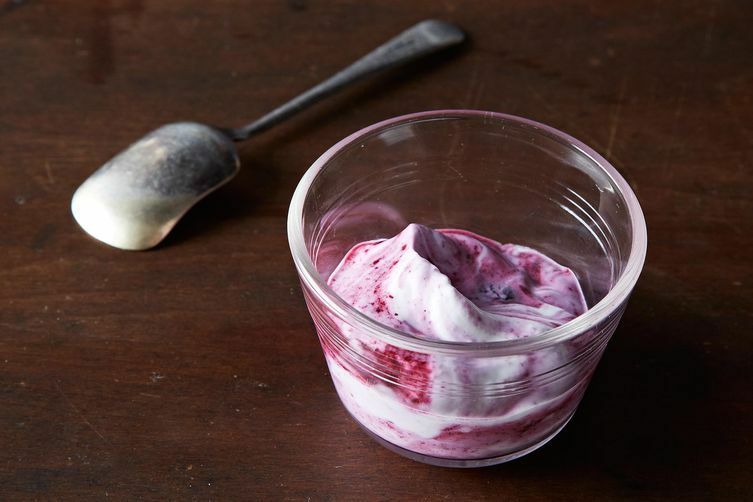 Yogurt is made by combining milk and live cultures -- it's easy enough to make at home. Full-fat, plain yogurt is fairly thin and light, so it's great to use in dressings, marinades, dips, soups, and in place of cream or buttermilk (just water it down to the right consistancy). Full-fat yogurt is almost always your best bet for cooking, since it's less likely to break. More: If you like things sweeter, make your own fruit yogurt. Greek yogurt has become tremendously popular in the last few years. It's made by straining out some of the whey in regular yogurt, which makes it a lot thicker, higher in protein, and tangier than regular yogurt (a higher concentration of lactic acid contributes to this tang). Use Greek yogurt in everything from deviled eggs and creamed spinach to tortes and frozen yogurts -- you can even use it in place of sour cream when you're in a pinch. 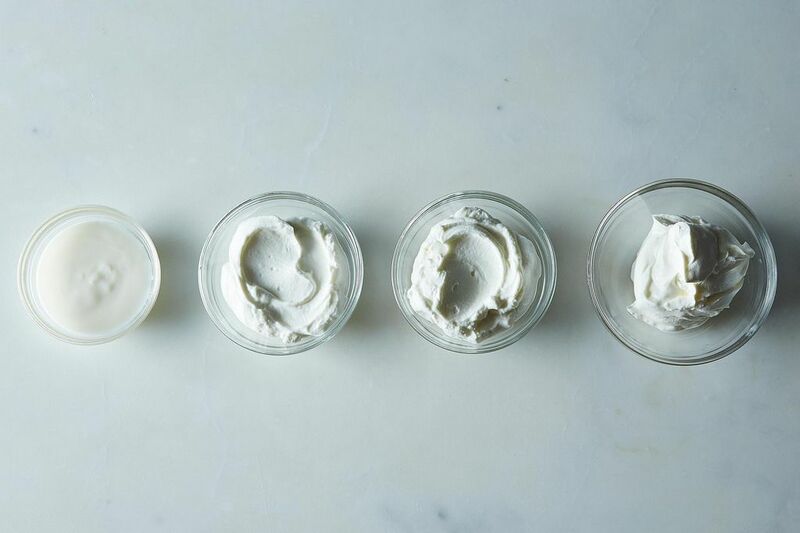 More: Get all the tools you need to make both regular and Greek yogurt on Provisions. Skyr is sort of like the Icelandic version of Greek yogurt, but it's even thicker than its Mediterranean counterpart: If you were to strain Greek yogurt, you would get skyr. It's usually a bit creamier than Greek yogurt and has even higher levels of protein. Skyr has been made since the Middle Ages in Iceland, often using raw milk, and the yogurt still plays a large role in Icelandic cuisine today (like in the dish hræringur: half skyr and half porridge, mixed together). Though skyr is still new to the United States, it's gaining in popularity as an alternative to Greek yogurt; its creaminess is perfect for mixing into smoothies and using as a base for granola. Native to the Middle East, labneh (also spelled labaneh, lebnah, labne, or labni) is sort of in its own category, falling somewhere between yogurt and cheese: It is considered a cheese, a yogurt, and a yogurt cheese, depending on who you ask. Its thickness is close to that of cream cheese. The main difference between yogurt and cheese is in the starter that's added to the milk; labneh is often made using yogurts, usually Greek. It is a great way to try yogurt in a savory context if you've never done so before (and you should) -- add it to shakshuka, or use it as a dip for vegetables or pita. If you want to serve it for dessert too, Alice Medrich has just the thing. What's your favorite kind of yogurt? How do you cook with it? Tell us in the comments! In the western parts of India people eat something called shrikand, which basically sweetened flavored drained yogurt. It is basically similar to Greek yogurt and possibly skyr. It's actually easy to make Greek yogurt at home, just by draining the whey from the yogurt. Yogurt is wrapped in muslin cloths and allowed to drip (hung from a faucet or lying in a strainer) until it is of your desired consistency. Love Siggi's Icelandic yogurt! Thick & creamy without that overly tartness of Greek yogurt! Higher in protein, not as much sugar, great flavors! Worth the price! Labneh is so amazing. So much creamier than even the best Greek. Skyr is too sour snd watery for me somehow, even when sweetened. Labne is delicious savory or sweet! Great protein too. Spread on good crusty French bread, drizzle with honey paired with fresh berries & your palate will be dancing! just started buying siggi's yogurt. loooove it. I love maple hill creamery plain (grassfed, organic and full fat) with sliced bananas, drizzled with farmer's market honey. Haha I love the descriptions of each yogurt in this post. I predict the next "it" yogurt will be Skyr -- which I'm pretty excited about! We have been loving skyr this summer! We have been finding another brand apart from Siggis called Smari, that comes in big tubs. Not cheap, but comparable to Fage. Interesting to learn that the Skyr is higher in protein. Will make the switch to Siggi's despite the higher price tag! I typically buy Greek yogurt but I would definitely buy the Icelandic yogurt. I would also be willing to try the Labneh. Allison, give Rivka's labne "recipe" a try - it's linked above. So easy and so delicious! This is so awesome! Recently I saw Bulgarian yogurt next to Australian Noosa yogurt on the shelf and started to get a little bewildered by it all.